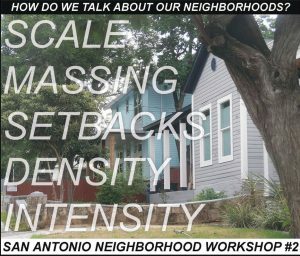 Please join us at the second of four neighborhood workshops sponsored by the San Antonio Conservation Society, the City’s Office of Historic Preservation, AIA San Antonio, and Tier One Neighborhood Coalition. It takes place on Saturday morning, January 26, 2019, in the Auditorium of the Frank L. Madla Accelerated Collegiate Academy Auditorium, 4018 S. Presa, from 9 a.m. – noon. In the first workshop, we agreed that we want to retain the physical and economic-social character of our neighborhoods. In this second workshop, we will focus on how we develop the common language of design to do that. Arrive at 9:00 a.m. for a breakfast taco and be a part of our hands-on creations of site plans that we would like in our neighborhoods. While the focus will be on all neighborhoods inside Loop 410, because of the development pressures they are facing, the workshop is open to all at no cost. Please RSVP to the Conservation Society at 210-224-6163 or email to conserve@saconservation.org.